From motorbike tyre Pressure and Running-in to Tread Depth, Inspection and Maintenance, take a look at TyreSafe’s top tips for motorcycle and scooter tyre safety. The correct inflation pressure is vitally important for safe handling of motorcycles, scooters and mopeds.The recommended pressure for original equipment tyres will be stated in the motorcycle owner’s manual. For fitment of aftermarket alternatives, advice should be sought from the tyre specialist or the tyre manufacturer. Specific advice from the tyre manufacturer is recommended for tyres fitted to classic and vintage motorcycles (pre-1960) where pressures quoted in the original handbook may be inappropriate. Pressures must be adjusted appropriately for solo and for pillion and pannier loads. It is dangerous to re-inflate a tyre which has been run flat or seriously under inflated. Such tyres should be removed for inspection by a tyre specialist. Prolonged under-inflation causes excessive flexing, deterioration of the casing and rapid wear of the tread edges. Your fuel consumption may also be adversely affected. Over-inflation may result in an uncomfortable ride, a reduced area of contact with the road, accelerated wear on the tread centre and makes the tyre more susceptible to impact damage. Inflation pressures should be checked once a week when the tyres are cold using an accurate and reliable pressure gauge. The running-in period allows the tyre to settle itself onto the wheel rim, serves to “scuff-in” the tread surface and allows the rider to adjust to the feel and handling of the new tyres. After fitment, ensure the tread surface is not contaminated in any way. Clean off any fitting lubricant, buff around the tread circumference with a dry cloth and ensure the label is removed. Whenever new tyres are fitted, the motorcycle should be ridden cautiously and the tyres not subjected to maximum power or speed for the first 100 miles. Avoid sudden acceleration, maximum braking or hard cornering and particular care should be taken on wet or greasy road surfaces. After 100 miles, the tyres should be checked to ensure the correct seating and inflation. 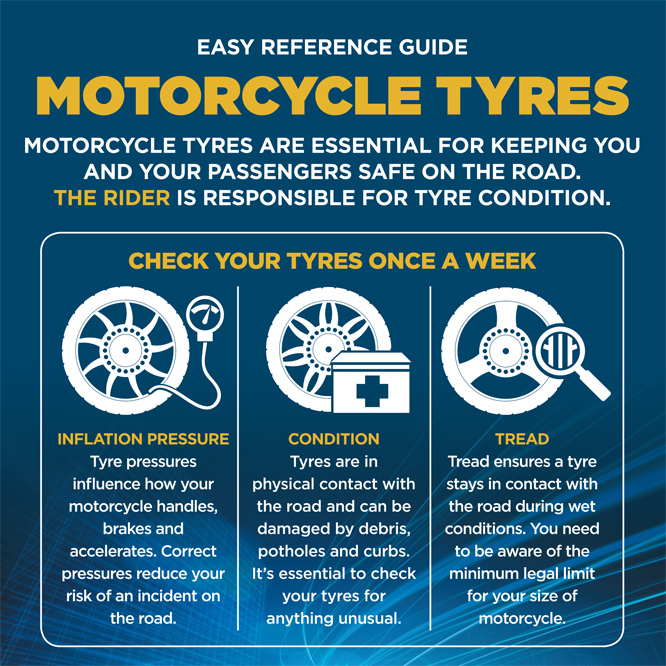 Motorcyclists are strongly encouraged to be aware of their tyres’ visual condition such as tread depth, cracking of the tread or sidewall rubber, cuts or bulges, foreign objects, as well as being alert to any change in dynamic performance or behaviour such as air loss, noise or vibration. Driving over potholes, kerbs and speed bumps, even at low speeds can result in the weakening or fracture of the tyre structure. Riders experiencing an in-service impact should ensure immediate inspection by a tyre professional. Lumps and bulges can indicate internal damage and should be examined by a tyre specialist without delay. Tyre treads are designed to give good wet grip but the road surface also plays a significant role in tyre to road adhesion. In general, wet grip decreases as tyre tread patterns wear down and as the depth of surface water increases. Riders should take this into consideration and reduce speed in wet conditions. Motorcycle tyres normally have tread wear indicators in the tread grooves and as these are approached, you should consider replacement. Once the indicators are level with the tread surface the tyre should be replaced. The legal limit of tyre tread depth in the UK for motorcycles over 50cc is 1mm across ¾ of the width of the tread pattern and with visible tread on the remaining ¼. For motorcycles up to 50cc the law requires that all the grooves of the original tread pattern must be clearly visible.